Innovative and effective practices at Cleveland's MC2 STEM High School are driving learning and higher achievement for students in a district where every student qualifies for free or reduced-price meals. Science, technology, engineering, and math (STEM) specialty schools have existed in the United States for over 100 years, fueled in the 1950s by the Cold War space race and recently reinvigorated by concern over U.S. students’ modest performance in math and science as compared to their international peers (Means et al., 2008). This is troubling because, according to the National Research Council (2011), “more than half of the tremendous growth to per capita income in the 20th century can be accounted for by U.S. advances in science and technology.” In addition, businesses in the United States have voiced concern over the supply and availability of STEM workers and experts are concerned that the demand for STEM labor will only increase with time (U.S. Department of Commerce, 2011, 2012). Thus, the primary goal of the STEM school movement is to promote a future STEM workforce and maintain the U.S. position as a leader in innovation. There is also the need for citizens and consumers to be informed and engaged in everyday decisions that involve scientific arguments -- from policy debates that will have consequences for their health and safety to the products they consume and lifestyle choices they make. community partnerships that provide tutors, mentors, internships, and service learning experiences. Preliminary research on successful STEM schools indicates that cultivating partnerships with industry, higher education, nonprofits, museums, and research centers is important for engaging students in STEM learning through internships, mentorships, interdisciplinary project-based learning, and early college experiences (Means, 2008; National Research Council, 2011). MC2 STEM is part of the Ohio STEM Learning Network, a network of ten STEM schools, developed with support from the Bill and Melinda Gates Foundation and in collaboration with the State of Ohio and various other partners. The Ohio STEM Learning Network is designed around five common principles. As a part of this network, MC2 STEM is an inclusive STEM school that accepts students via lottery, as opposed to competitive selection, and is committed to the idea that STEM talent is something that can be developed, rather than something innate that must be identified (Means, 2008). Project-based learning (PBL) has been shown to improve students' understanding of science, as well as their problem-solving and collaboration skills, to a greater extent than traditional methods (Geier et al., 2008; Gordon, Rogers, Comfort, Gavula, and McGee, 2001; Kolodner et al., 2003; Lee, Buxton, Lewis, and LeRoy, 2006; Liu, Hsieh, Cho, and Schallert, 2006; Lynch, Kuipers, Pyke, and Szesze, 2005; Marx et al., 2004; Schneider, Krajcik, Marx, and Soloway, 2001). Students who learn science or technology through project-based learning also report that they find it more engaging than traditional instructional techniques (Geier et al., 2008; Yazzie-Mintz, 2010). PBL is the biggest component at MC2 STEM and is perhaps even more engaging to students because of its interdisciplinary content. Interdisciplinary curricula have been shown by several studies to support students’ engagement and learning (Taylor and Parsons, 2011), and specifically integrating science with reading comprehension and writing lessons has been shown by several studies to improve students’ understanding in both science and English language arts (Pearson, Moje, and Greenleaf, 2010). MC2 STEM's transdisciplinary capstone projects blend science, English language arts, social studies, fine arts, engineering, and math, and are designed to transcend in-school and out-of-school environments. Their projects more closely resemble the tasks and ambiguities inherent in real life and help to make schoolwork more relevant to students’ lives, as well as more transparently linked to the skills needed to succeed in the working world. For example, in the “Bridges" capstone (PDF), students learn about the mathematical and engineering concepts necessary to construct bridges, as well as the symbolic meaning of bridges in literature, history, and social studies. In addition to the Common Core state standards, career-readiness standards for engineering and technology are also incorporated into several of the capstone projects at MC2 STEM. For example, all students complete a Sophomore General Electric Project (PDF), which is designed with GE Lighting employees to address current industry needs. According to Principal Jeffrey McClellan, if instructors are having difficulty coming up with a unit for a particular benchmark, industry partners have been helpful in brainstorming and explaining how particular state standards are used in their work, which results in more realistic capstone units. MC2 STEM is a challenging learning environment that holds high expectations for all students, while also providing multiple forms of support for students to show and develop learning. 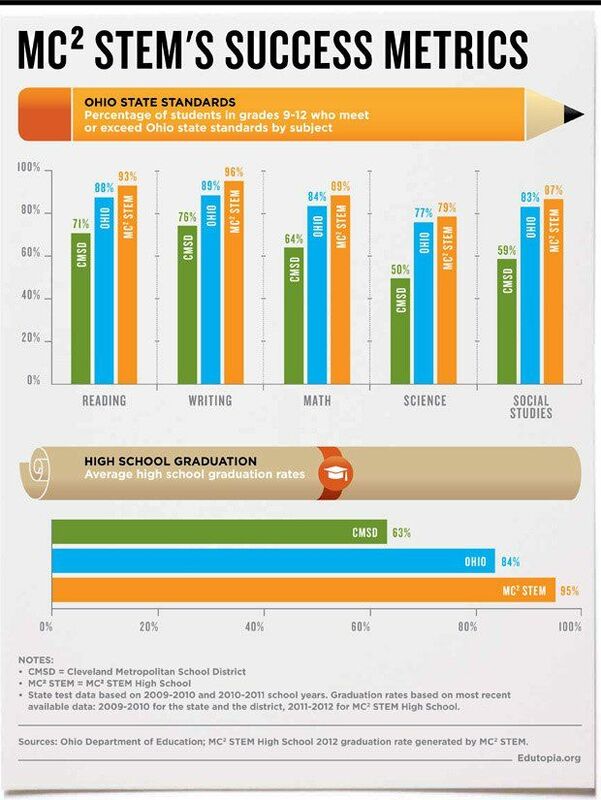 The MC2 STEM graduation requirements state that in order to earn high school credit, students must achieve mastery (PDF) (greater than or equal to 90 percent in grades 9 and 10, and greater than or equal to 70 percent in grades 11 and 12) on each and every state standard. In addition, students must participate in 60 hours of community and/or STEM service and complete a GE sophomore project as well as a senior project in which they address an original research question. About half of MC2 STEM students fulfill all mastery requirements in the first three years. If a student doesn’t master a benchmark during a specific capstone, they are not required to retake that course. Instead, the missing benchmark is noted on their grade-card and teachers work with the student to integrate those benchmarks into subsequent capstones. (The digital grade-cards (PDF) provide a real-time picture of student progress toward mastery, and the school uses the 21st Century Partnership for STEM Education’s online grade-card system, which is a proficiency-based assessment that gives access to the school’s parents and teachers.) About 40 percent of the state standards are assessed through capstone projects, and the rest of the standards are assessed through more traditional in-class methods such as quizzes and presentations. During most classes, students work in groups based on the particular benchmark activities or assessments that they are mastering, while the teacher and tutors walk around and provide assistance. Students also participate in many extended-learning activities to support their learning, including summer learning at Case Western Reserve University and tutoring and mentorship programs. Students in grade nine meet with NASA employees four school days a year at NASA Glenn Research Center, and about one-third of freshmen work with NASA tutors after school for one hour, once or twice per week. Throughout the time they are working with the school, NASA tutors work with the same students so relationships can develop. Similarly, in grade ten, GE employees tutor students once or twice per week during lunch, and each tutor works with the same student for the entire time they are in the tutoring program. In addition, all sophomores spend two lunch periods per month with a GE mentor. Students report feeling cared about and supported at the school at a level that is above the district’s average, according to the district’s 2010 Conditions for Learning Survey. The dropout-prevention research has also emphasized that “close mentoring and monitoring of students” is critical (Fairfax County Public Schools, 2011). According to McClellan, more often than not, simply asking a student why they haven’t been meeting expectations is the first step toward addressing the issue that is holding them back. MC2 STEM is a small learning environment with approximately 300 students; however, the school’s design also incorporates frequent feedback into the curriculum and successfully increases its capacity for tutoring and mentoring through community partnerships with NASA, GE, and the Jewish Federation of Cleveland, as well as with interns and UTeach candidates from Cleveland State University. As described below, community partnerships also help to provide students with feedback from diverse stakeholders through internships and service-learning. Project-based learning helps to connect schoolwork with the work of professionals, and these connections are made further transparent through professional mentoring as well as internship and service-learning experiences. As MC2 STEM students demonstrate mastery of state requirements, they earn the opportunity to participate in paid and unpaid internships (PDF) for high school credit. The principal determines internship readiness, with input from the guidance counselor and professional partners where appropriate. The potential employer interviews the student and decides if the student is hired for their internship. Currently over 50 percent of seniors and 40 percent of juniors are participating in paid internships, and about 90 percent of the class of 2012 participated in an internship prior to graduation. In addition to internships, all students are required to complete 40 hours of community service. Research supports the potential benefits of internships or apprenticeships and community service for academic achievement and student engagement when these experiences are closely connected with curricular objectives (Bell, Blair, Crawford, and Lederman, 2003; Billig, 2007). Rigorous studies from the career-academy literature have also shown that integrating academic and work experiences can have positive impacts on students’ later earnings. Graduates of career-themed high schools that emphasized the connection between school and getting a good job earned 11 percent more per year, on average, than graduates of traditional high schools eight years after graduating (Stern et al., 2010). Similarly, the dropout-prevention literature emphasizes the importance of making school relevant to students’ lives and making sure that school is engaging and challenging. 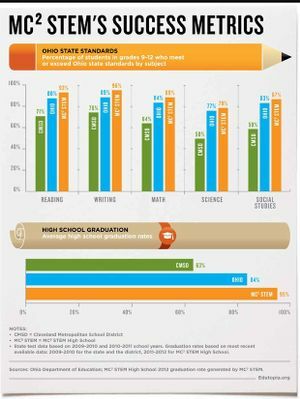 In a 2006 survey of students who dropped out of high school, 81 percent said that if schools provided opportunities for real-world learning, including internships and service-learning, it would have improved their chances of graduating high school (Bridgeland, Dilulio, and Morison, 2006). The study also found that clarifying the links between school and getting a job may convince more students to stay in school (Bridgeland et al., 2006). Bell, R. L., Blair, L. M., Crawford, B. A., and Lederman, N. G. (2003). Just Do It? Impact of a Science Apprenticeship on High School Students’ Understandings of the Nature of Science and Scientific Inquiry. Journal of Research in Science Teaching, 40(5), 487-509. Billig, S. H. (2007). Unpacking What Works in Service-Learning Promising Research-Based Practices to Improve Student Outcomes. Growing to Greatness, p. 18-28. National Youth Leadership Council. Bridgeland, J. M., Dilulio, J. J., and Morison, K. B. (2006). The Silent Epidemic: Perspectives of High School Dropouts. Buck Institute for Education. (2009). Does PBL Work? Fairfax County Public Schools. (2011). Bringing the Dropout Challenge into Focus. Fairfax County, VA: Department of Professional Learning and Accountability, Office of Program Evaluation. Geier, R., Blumenfeld, P. C., Marx, R. W., Krajcik, J. S., Fishman, B., Soloway, E., et al. (2008). Standardized Test Outcomes for Students Engaged in Inquiry-Based Science Curricula in the Context of Urban Reform. Journal of Research in Science Teaching, 45(8), 922–939. Gordon, P. R., Rogers, A. M., Comfort, M., Gavula, N., and McGee, B. P. (2001). A Taste of Problem-Based Learning Increases Achievement of Urban Minority Middle-School Students. Educational Horizons, 79(4), 171-175. Kolodner, J. L., Camp, P. J., Crismond, D., Fasse, B., Gray, J., Holbrook, J., and Puntambekar, S. (2003). Problem-Based Learning Meets Case-Based Reasoning in the Middle-School Science Classroom: Putting Learning by Design into Practice. The Journal of the Learning Sciences, 12(4), 495-547. Lee, O., Buxton, C., Lewis, S., and LeRoy, K. (2006). Science Inquiry and Student Diversity: Enhanced Abilities and Continuing Difficulties After an Instructional Intervention. Journal of Research in Science Teaching, 43(7), 607-636. Liu, M., Hsieh, P., Cho, Y. J., and Schallert, D. L. (2006). Middle School Students’ Self-efficacy, Attitudes, and Achievement in a Computer-Enhanced Problem-Based Learning Environment. Journal of Interactive Learning Research, 17(3), 225-242. Lynch, S., Kuipers, J., Pyke, C., and Szesze, M. (2005). Examining the Effects of a Highly Rated Science Curriculum Unit on Diverse Students: Results from a Planning Grant. Journal of Research in Science Teaching, 42(8), 912–946. Marx, R. W., Blumenfeld, P. C., Krajcik, J. S., Fishman, B., Soloway, E., Geier, R., et al. (2004). Inquiry-Based Science in the Middle Grades: Assessment of Learning in Urban Systemic Reform. Journal of Research in Science Teaching, 41(10), 1063–1080. Means, B., Confrey, J., House, A., and Bhanot, R. (2008). STEM High Schools Specialized Science Technology Engineering and Mathematics Secondary Schools in the U.S. SRI Project P17858. National Research Council - Committee on Highly Successful Science Programs for K-12 Science Education, Board on Science Education and Board on Testing and Assessment, Division of Behavioral and Social Sciences and Education. (2011). Successful K-12 STEM Education: Identifying Effective Approaches in Science, Technology, Engineering, and Mathematics. Washington, DC: The National Academies Press. Pearson, P. D., Moje, E., and Greenleaf, C. (2010). Literacy and Science: Each in Service of the Other. Science, 328, 459-463. Schneider, R. M., Krajcik, J., Marx, R. W., and Soloway, E. (2002). Performance of Students in Project Based Science Classrooms on a National Measure of Science Achievement. Journal of Research in Science Teaching, 38(7), 410-422. Stern, D., Dayton, C. and Raby, M. (2010). Career Academies: A Proven Strategy to Prepare High School Students for College and Careers. Berkeley, CA: University of California at Berkeley, Career Academy Support Network. Taylor, L. and Parsons, J. (2011). Improving Student Engagement. Current Issues in Education, 14(1). U.S. Department of Commerce. (2012). The Competitiveness and Innovative Capacity of the United States. Wiggins, G. and McTighe, J. (2005). Understanding by Design. Expanded 2nd Ed. Alexandria, VA: Association for Supervision and Curriculum Development. Yazzie-Mintz, E. (2010). Charting the Path from Engagement to Achievement: A Report on the 2009 High School Survey of Student Engagement.